Mystery Blue Conquer the World, at least they hope so or maybe the European theater. Founded by guitarist Frenzy Philippon, France's Mystery Blue enters its thirtieth year with their seventh album. Mystery Blue: it says so at the top. 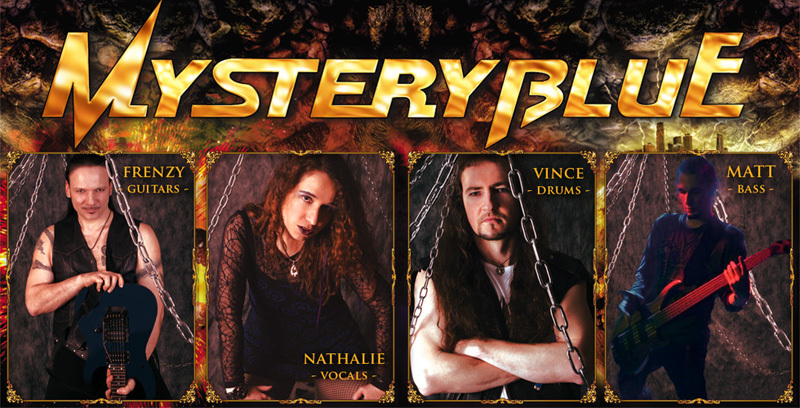 Mystery Blue is also another band with a female lead vocalist, but don't go down the symphonic or gothic metal road. Nathalie Geyer is not some operatic diva; she's definitely a metal vocalist, a heavier Doro possibly, and the band plays straight up heavy and power metal. There's no attempt to be atmospheric or symphonic with layers of synthesizers. Most of the material here is hard charging metal, right from the gate. You get a small respite about two-thirds in with the metal ballad Keep On Dreaming. Actually, the pace and feel of the music, and Geyer's vocals, music can get darn right redundant after about five songs. The listener has to listen to the nuances in the arrangements to get a deeper appreciation for the songs, like the drums in the title track or the guitar solos in Evil Spell and Ticket to Hell. Generally, however, after several songs, you know what you're going to get the rest of the way through. The exception is the bonus track Accroche-Toi � Tes Reves (Keep hold of your dreams, roughly translated), a metal anthem with inspiring grandeur. In the end, Mystery Blue's Conquer the World will likely please their fans, and those that like classic heavier metal with a gutsy female lead vocalist. 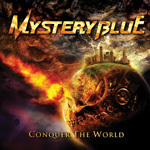 Mystery Blue's Conquer the World will likely please their fans, and those that like classic heavier metal with a gutsy female lead vocalist.